When the original Farmville was first introduced to gamers via the game section on Facebook it instantly caught on - largely because it offered a combination of instant gratification and a complex task-based progression. While Country Escape is not really part of the main game series, it helps to understand the basic goals and game play mechanics of the main series to appreciate just how subtle the design is for this new addition. In the main series you begin by laying the crop squares - as many as the available land will hold up to whatever the limit is for the size of farm you have, and then plant either the seeds you can afford or the seeds required for the quest you are working - whichever applies the most. Once the basic crop planting, tending, and harvesting skills are acquired the game then adds additional resources in the form of crop-producing trees, and then farm animals. Once those are mastered the quest system kicks in, and familiarity there helps the player to adapt to the event system that adds special missions and rewards. With all that in mind, players who are familiar with the main series will also be aware that game play mechanics for the series is a very complicated array that is priority-based, while game play in this new addition, while similar, is less complicated to the extent that it allows for an easy-flowing and almost zen-like game play style. 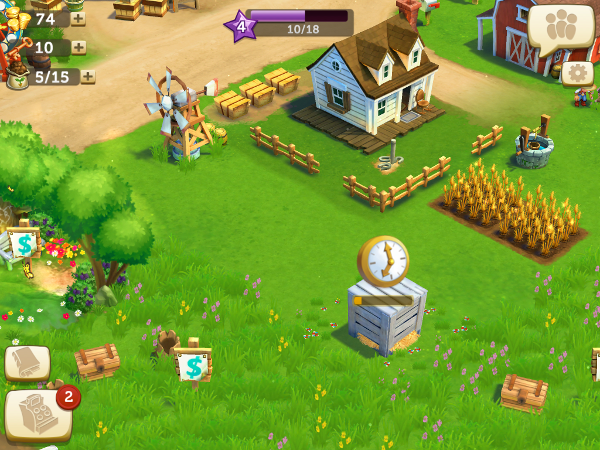 That nicely covers the elements that are similar to the main game - but there are also new elements in Country Escape that are not found in the main series, including special areas in which the farm helper NPCs can be assigned in order to obtain random items - including special resources that are used to expand the available services and capabilities of the crafting system.